Leroy Neiman has painted Superbowls, the Kentucky Derby, the Masters golf tournament, untold celebrities and even bicycle racing. And he is becoming part of Kimberlee's Bikes for Kids Bike Art Spectacular with his donation of "Indoor Cycling", a piece he painted in 1979 that shows two racers executing an exchange during a Madison race on a velodrome. "My earliest memory of bicycle racing was Reggie McNamara, a six-day bike racing champion when I was a kid, in the '30s," says Mr. Neiman. "He was a hero. Reggie McNamara was right up there with Babe Ruth and Jack Demsey and those kind of people in that great period of early sports." 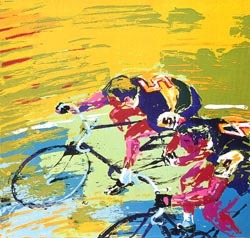 Mr. Neiman has also painted numerous cycling luminaries including Jacques Anquetil, Bernard Hinault and Greg LeMond. "I've got drawings from bicycle racing at the Olympics, the Tour de France. It's a great sport and it's very visual." His Indoor Cycling print is a signed and numbered serigraph (#106 of a print run of 300), which carries a retail value of $2,400. It will be one of dozens of paintings that have been donated to the Bike Art Spectacular taking place November 7 in San Diego at the Quilt Art Vision Gallery in Liberty Station. The event will benefit Kimberlee's Bikes for Kids, a 501(c)(3) non-profit foundation that buys new bikes, helmets and locks for underprivileged children. "It can't get much better than receiving art from Leroy Neiman," says Dan Gindling, president of Kimberlee's Bikes for Kids. "Mr. Neiman's art is collected by some of the most famous people in the world, so to have one of his prints to sell at the Bike Art Spectacular is a real honor." The Bike Art Spectacular will feature bicycle-themed art from all over the world. The art will be displayed and sold at the reception on November 7th. In addition, the reception will include a silent auction, door prizes, drinks and appetizers. Remaining art not sold at the reception will be featured in a special eBay auction from November 9-16. The donated art boasts original paintings, limited-edition prints, hand-embellished giclee's, sculptures, photographs, recycled art, T-shirts, jewelry and cards which carry retail values from $5 to $5,000.